Tan Sri Dato’ Seri Dr Jeffrey Cheah (third from left) and Dr Lee Boon Chye (fourth from left) with a group of dignitaries at the launch. Sunway Medical Centre is collaborating with Royal Papworth Hospital to facilitate knowledge exchange among cardiology and respiratory experts. “We are also proud to be collaborating with Royal Papworth in several fields. 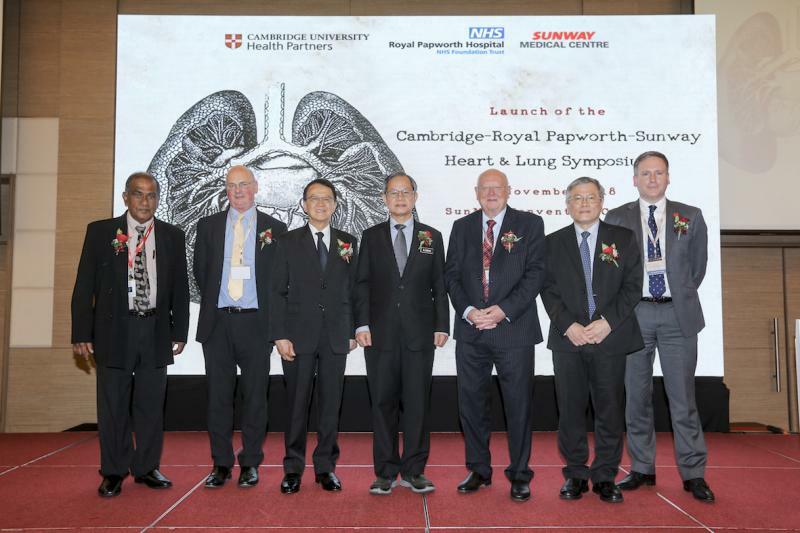 Royal Papworth Hospital is a world-leading heart and lung hospital, which performed the world’s first heart, lung and liver transplants in 1986,” said Cheah, at the launch of the Cambridge-Royal Papworth-Sunway Heart and Lung Symposium recently. The collaboration is expected to enhance the standards of clinical training and medical education for healthcare professionals and enable Sunway to participate in cutting-edge research and clinical trials and explore innovations in healthcare. In an agreement with the University of Cambridge (UC), Sunway Clinical Research Centre was established as the regional site partner of UC’s School of Clinical Medicine. This will lead to clinical trials as well as research and training aimed at prevention, earlier diagnosis and improved treatments for a range of diseases suited to the Asian genetic composition. The centre is the first such venture in the world for UC. Sunway is also the first accredited cardiac surgical advanced life support (CALS) training centre in Southeast Asia (SEA) with the signing of a tripartite memorandum of understanding (MoU) among Dr Adrian Levine, managing director of CALS-S-Limited UK and CALS founder; Dr Anand Sachithanandan, CALS-SEA clinical director; and Lau Beng Leong, managing director of Sunway Healthcare Group. CALS training courses will begin in 2019 and involve relevant healthcare professionals in Malaysia and the ASEAN region. CALS trains surgeons, anaesthetists, intensivists and intensive care and high-dependency unit nurses to swiftly recognize and effectively treat a cardiac arrest in patients who have had recent open heart surgery. In line with cutting-edge technology, Sunway acquired the Philips Azurion 7 biplane, the first image-guided therapy system in Southeast Asia which can merge CT scans and live angiographs for precise navigation of the patient’s heart. The device will be used for the diagnosis and treatment of blocked coronary blood vessels and structures in adults and children, even in newborns. Sunway received the Medical Tourism Hospital of the Year award in Asia Pacific category at the Global Health and Travel 2018 Awards. The award reflects Sunway’s commitment towards the government’s goal of making medical tourism a major income driver for the country’s economy, said Cheah. “Southeast Asia is increasingly becoming popular with medical tourism and Malaysia is also acting as a healthcare hub for Southeast Asia. We are emphasizing on the setting up of cardiology and fertility centres as our focus for healthcare tourism for Malaysia,” said Dr Lee Boon Chye, deputy minister, Ministry of Health (MOH). The private sector is encouraged to promote medical tourism as it is a vital source of growth in the economy; an attraction for talented Malaysians to serve the country and can relieve the burden for MOH facilities. The success of a hospital depends on the management, technology and the consultants and their ability to uphold professionalism and maintain a high standard of patient care, said Lee.